The 25th Anniversary Welsh Dairy Show was held on Tuesday October 15th at the United Counties Showground near Carmarthen. There were three Guernsey exhibits forward from The Addington Fund, Brian and Sheila Adams and D & H Cox/J. Warren. 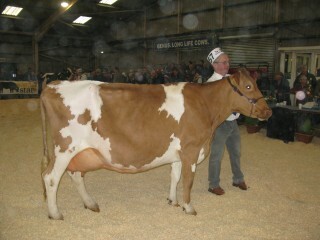 Trewey Prince Poppy 26th was exhibited by Brian and Sheila Adams in the calf classes on the Monday evening. The Addington Fund’s Heifer in Calf, Hamps Valley Annabelle 7th, made her last appearance before being raffled in December. 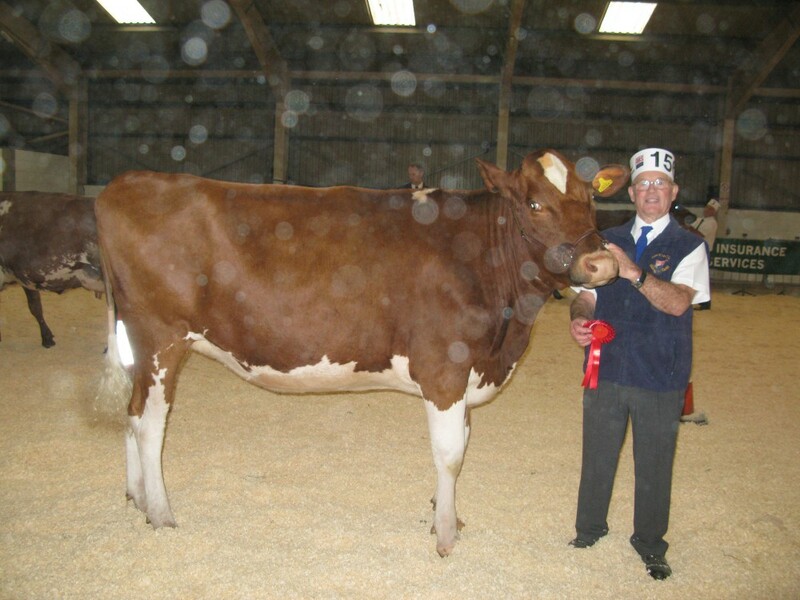 She was made Reserve Champion Heifer behind The Cox and Warren’s Tredinney Yogi’s Primrose 29th, a heifer in Milk, who in the Interbreed Heifer Championship, did not stand at the bottom of the line. Champion Heifer, Tredinney Yogi’s Primrose with “substitute” handler, Colin Evans! Many thanks to Brian and Sheila Adams and Daf and Helen Cox for ensuring a Guernsey presence at this 25th Anniversary Show.